(Steve Griffin | The Salt Lake Tribune) Utah gymnast MyKayla Skinner before practice at the Dumke Gymnastics Center on the University of Utah campus in Salt Lake City Monday April 16, 2018. St. Louis • The brilliance of MyKayla Skinner is verified at the very mention of her name. Because when the three syllables are voiced, those closest to her — who’ve seen her grind through the week-to-week pressure, through the clouds of chalk, during the milliseconds in flight where she’s always in control — immediately beam. 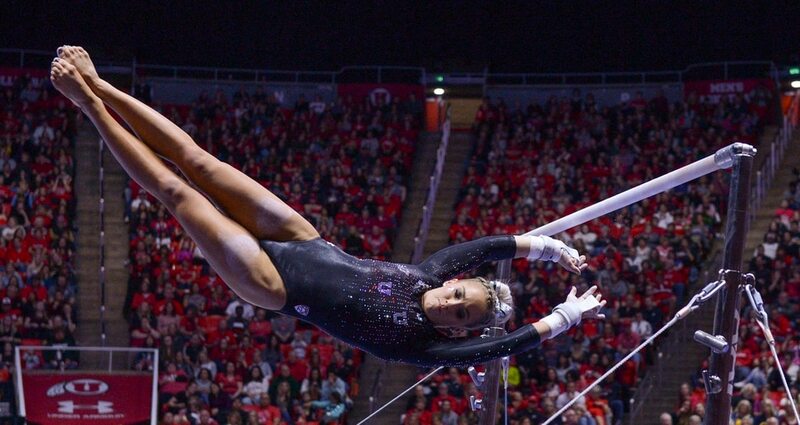 They do distinctly, differently, but they’re all transported to those days in the gym or those nights under the lights where Skinner wows, and wows unlike any other Utah gymnast has. Tom Farden shrugs his shoulders. Maddy Stover’s eyes light up. Kari Lee shakes her head back and forth only to emphasize greatness. It might get old when you’re asked as much as they’re asked. You might swerve toward cliches or shift the attention elsewhere in the conversation, but explaining MyKayla Skinner and what already has her on track to becoming one of the most dominant University of Utah student-athletes ever is what they’re used to. “She’s honestly not human,” said Lee, a redshirt junior. “She’s just automatic,” said Stover, a senior. Skinner, a sophomore who is the defending NCAA floor champion and finished second in the all-around a year ago, already is second in program history with 21 career all-around competition wins. And with Year 2 still yet to be finished, she’s a 13-time all-American, climbing up the record books of a historically successful program. She’s one of the established names entering this weekend’s 2018 NCAA gymnastics championships in St. Louis, a star in the sport with the task of helping carry the No. 5-ranked Red Rocks out of the semifinals and into the Super Six final Saturday evening. And she basically can do it whenever she wants. How can you ask for more? Marsden and Farden, Utah’s co-coaches, are finding out. Skinner is, too. There is more to unearth, more to perfect, even for a former Olympic alternate like Skinner. Collegiate gymnastics is different from the elite realm, where difficulty is ramped up to its highest for the largest of stages. Skinner, according to her coaches, boasts the most difficult floor routine in the country and one of the hardest vaults. So what else can a sophomore already on her way to historic levels do? That’s where Marsden chuckles a bit. She knows floor and vault is where Skinner can dominate at the drop of a dime. Marsden wants to see Skinner up the ante on uneven bars and balance beam. After that, it’s just fine-tuning the little things. Where Marsden marvels is Skinner’s ability to bust out her big skills in several events on a weekly basis throughout a college campaign. “I haven’t worked with an athlete quite like her,” Marsden said. Skinner has 76 individual titles in two seasons at Utah, including 33 this season, including nine in the all-around. She’s one of just two gymnasts in the history of the Pac-12 to win back-to-back all-around titles at the Pac-12 Championship meet. She’s the only gymnast ever to do it in her first two years in college. She owns conference records for most Pac-12 Gymnast of the Week awards in a season (7) and a career (12). Skinner also was the only gymnast to make the 2018 All-Pac-12 first team in all four events, plus the all-around. Despite the thorough dominance in her first two season leading the Red Rocks, Skinner has yet to win Pac-12 Gymnast of the Year. Skinner knows where to go when the outside noise might feel like it’s getting too loud. To the gym, out on the floor, so she can zero back in. It’s where she says she briefly can escape it all: schoolwork, people, media attention and social media. “It’s your zone,” she said. She describes her first two years at Utah as “a dream come true.” She admits this year has been frustrating at times but doesn’t jump into why. The accolades are great, Skinner said, because even she admits she didn’t think the transition from elite gymnastics, from being a national-team contender to college would go this smoothly this quickly. Reality is, she’s definitely there. Her elite gymnastics coach Lisa Spini, who coached Skinner at Desert Lights Gymnastics in Chandler, Ariz., since the age of 11, said she isn’t the least bit surprised by the superiority displayed by Skinner. The two also continue to talk about Skinner making a run at the 2020 Olympic team. Skinner’s all-around score bested Price’s in each of the three meets they competed head-to-head this season — Elevate the Stage in January, the Pac-12 meet and the NCAA Regional. Skinner’s season average on bars, vault, beam and the all-around edged Price’s averages in those events, but Price’s season average on the floor nipped Skinner’s. Price did score three 10s — two on floor, one on beam — to none for Skinner this season. To Skinner, this latest phase of evolution in the sport is rooted to adapting and thriving for the team’s benefit, unlike the cutthroat elite scene where it’s hyper-focused on individual success. The way coach Farden sees it, Skinner’s legacy at Utah already is being published on a weekly basis. But there are two things left she can do that would leave it unparalleled. “She could lead this team back to the promised land and on top of the NCAA finishing as national champions,” he said. “And I think she can be the all-around champion,” he added. But if anybody has it, it’s Skinner. “She has just a ‘grrrr’ deep inside her that shows up on the competitive floor,” Marsden said. Stover’s definition of Skinner’s mastery in gymnastics is how she blocks out everything. Like those days when she needs to zero in at the gym, looking to silence the noise, Skinner rises and rises. She refuses to let the moment best her regardless of previous scores put down by opposing gymnasts. It’s undeniable to those in the gymnastics universe. The Red Rocks take aim at advancing to their 21st Super Six final since 1993 this weekend in St. Louis, feeling poised to once again go toe-to-toe with fellow powerhouses like Oklahoma, LSU, UCLA and Florida. Leading the way will be the 5-foot-tall dynamo capable of planting a perfect 10 every time her feet return to the ground. With plenty of runway left in front of her. Super sophomore • Defending NCAA floor champion, runner-up in the all-around in 2017, second in program history with 21 all-around wins, 13-time all-American, has 76 individual titles in two seasons, including 33 wins in 2017-18, one of two Pac-12 gymnasts to ever win back-to-back all-around titles.